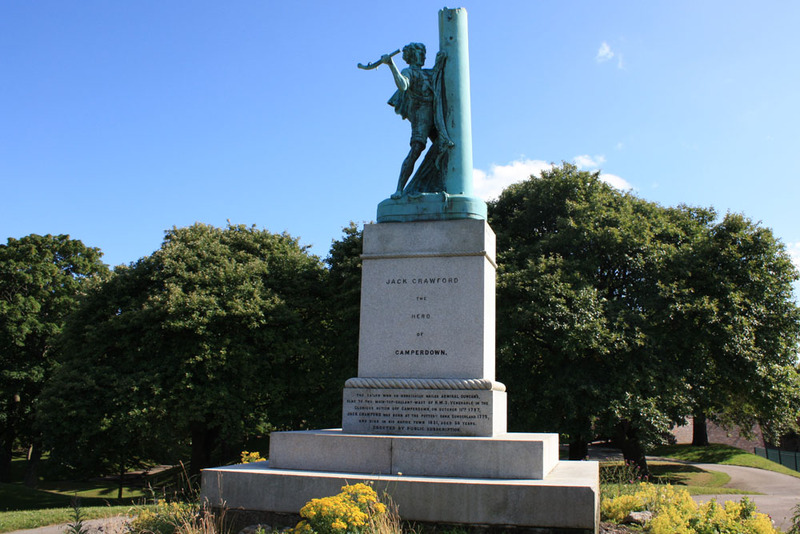 Perhaps the best-known monument in Mowbray Park is that dedicated to the Sunderland sailor, Jack Crawford. The monument was unveiled in 1890 and depicts Jack in his most famous act: nailing a flag to a ship’s mast. Strangely the monument was erected rather late as Jack died in 1831 and the heroic act for which he was famed took place in 1797. Crawford was born in Sunderland’s ‘East End’, the port area of ‘Old Sunderland’ as it is known. He worked for a time as a keelman before he was enforced into the Royal Navy by a press gang in 1796. On October 11, 1797 a British fleet under Admiral Duncan was engaged in the Battle of Camperdown off the coast of Holland against the Dutch fleet when the mast of the Admiral’s ship The Venerable was shot down along with his flag. Lowering of the flag signified a surrender, so the brave – or perhaps drunken – Jack, climbed what remained of the mast – he was probably ordered to so so – and nailed the flag in place. He performed this heroic act as the Dutch fired their bullets upon him, with one piercing his cheek. Crawford’s actions are believed to have given rise to that well-known phrase “nailing your colours to the mast”. Victory followed and Jack was proclaimed a national hero. He was even presented before the King. Sadly, Jack fell on hard times and poverty in later life, when he was often found to be drunk. Jack Crawford died in 1831. He was one of the first victims of the horrific cholera epidemic that entered the country through the port of Sunderland. The disease swept across the nation where it killed around 32,000 people. Originating in India, this epidemic had already killed millions before entering Britain via Sunderland where the first fatality was a 12-year old girl called Isabella Hazard who lived near the River Wear. She died only a day after contracting the disease. Sunderland Museum and Winter Gardens overlook a lake at the northern end of Mowbray Park near the terminus of Fawcett Street which runs to the north. Beginning its life in Fawcett Street’s Athenaeum Building, the Sunderland Museum was the first publicly run museum in the country outside London. As its collections grew the museum was relocated to its present site. The first stones of the new building were laid by the Sunderland Mayor (and Sunderland Echo founder) Samuel Storey, with the recently retired President of the United States, Ulysses Grant in attendance. The new museum opened in 1879, along with the glasshouse of the adjoining Winter Gardens, based on London’s Crystal Palace. Today, exhibits in the museum include a fossil of Britain’s oldest-known flying reptile, a 250 million year old Coelurasuravus found at Eppleton near Hetton-le-Hole. There are many displays relating to the history of Sunderland including an impressive collection of paintings and many beautiful examples of Sunderland lustreware pottery.